The Quest Begins… Focus Features has unveiled the first teaser trailer for Laika's stop-motion animated movie Kubo and the Two Strings, a fantasy adventure inspired by "Japanese folktales and mythology, with lost civilizations, mystical origami, noble heroes, star-crossed lovers, and blood-curdling monsters." The voice cast includes Matthew McConaughey, Charlize Theron, Rooney Mara, Ralph Fiennes, Cary-Hiroyuki Tagawa, and Art Parkinson as Kubo. This teaser doesn't reveal too much yet, but it does give us a glimpse at the characters and the world, and I have to say - this looks awesome, I am so looking forward to it. It looks like Laika is really pushing themselves, with huge sets and challenges like rain. Enjoy! In the epic fantasy, scruffy, kindhearted Kubo ekes out a humble living while devotedly caring for his mother in their sleepy shoreside village. It is a quiet existence – until a spirit from the past catches up with him to enforce an age-old vendetta. Suddenly on the run from gods and monsters, Kubo's chance for survival rests on finding the magical suit of armor once worn by his fallen father, the greatest samurai the world has ever known. Summoning courage, Kubo embarks on a thrilling odyssey as he faces his family’s history, navigates the elements, and bravely fights for the earth and the stars. Kubo and the Two Strings is directed by animation producer Travis Knight, who produced ParaNorman and The Boxtrolls for Laika previously, now making his feature directing debut. The screenplay was written by Marc Haimes and Chris Butler. 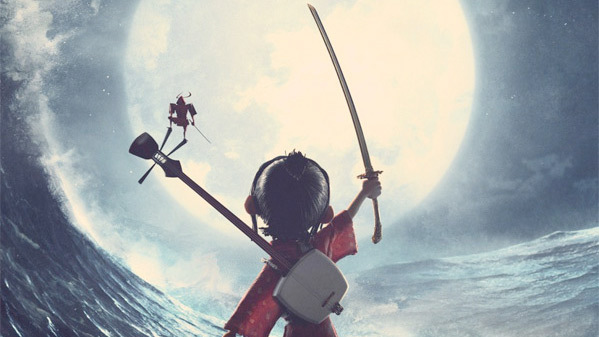 Focus Features will release Kubo and the Two Strings starting on August 19th, 2016 next summer. Always up for Laika, they are the best. Laika is truly full of Magic. Wow. Im on board all the way. Damn! Impressive. I know it would probably never happen, but I would love to watch this in a Japanese dub. WOW! That was absolutely incredible!!!! I am all in!!! !